Thyme Project - are you using your Thyme wisely? Are you using your Thyme wisely? Thyme roots love the cool root run under the stones or pavers, and the tiny amount of moisture that will accumulate there. Good drainage is essential, both for the thyme and the patio. If you're thinking of inviting these lovely garden plants into your landscaping with a thyme lawn, or draping over a stone wall, or mixed and mingled with paving stones to soften and blend and create a rich and lovely carpet, share it here. 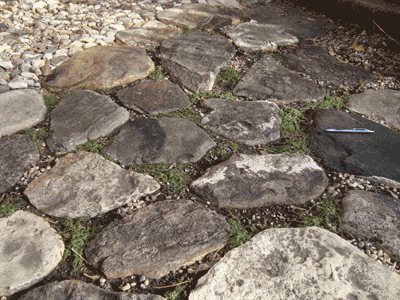 Ron is a customer in Saskatchewan who has an on going project using real stone to build a patio and a walkway, and planting Elfin thyme amongst them. Two seasons later, Ron's patio is starting to take on a more established look. 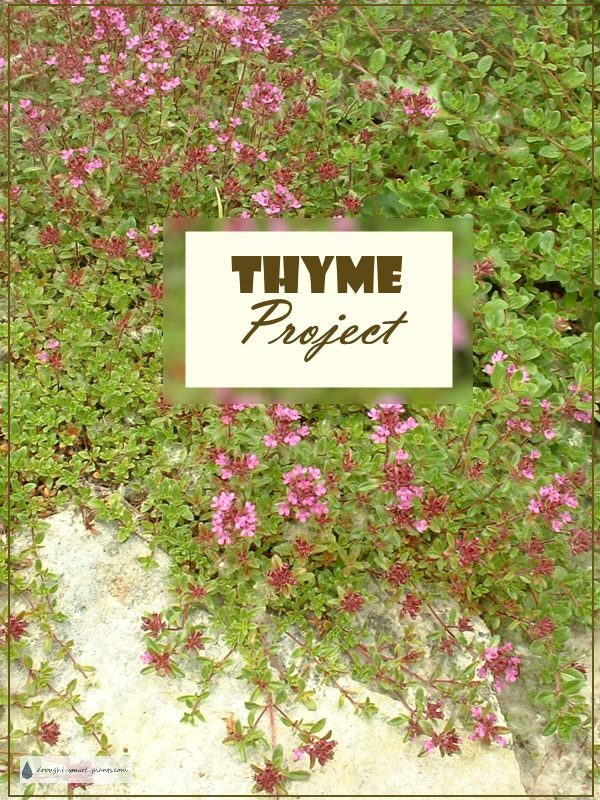 I'll let Ron tell you his story about this great thyme project. This first picture is a close-up of a part I planted in September 2008 and it shows the amount of growth since (the pen is for scale). The pea gravel gets slowly removed as the plants spread…. Wider view above shows the full scope of the project! Still looking for more ideas? 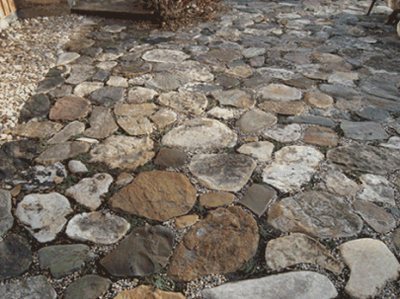 Look on at some patio design ideas and see how to build a patio here. If you like courtyard landscaping or thyme lawns these pages might interest you. What's the hold up? Start on your own project now. Do you have a thyme project you want to brag about? Tell us all about it, and show us pictures - xeric gardeners like photos of projects. I'd love to hear about any of your projects using thyme - a thyme stool, lawn or a patio planted with thyme. What is your thyme story about? Add your pictures here - Click the button and find it on your computer. Then select it.